Summary: We report an extremely unusual iatrogenic infection of the spinal canal with Aspergillus fumigatus that resulted in intradural abscess formation following epidural steroid injection in an immunocompetent young individual. Although the imaging findings of the infection were relatively nonspecific, MR imaging not only allowed for a prompt diagnosis, but also helped in surgical localization to the intradural compartment. Complications from the use of these injections are briefly discussed. For a number of years, epidural lumbar steroid injections have been administered to patients with back or radicular pain secondary to degenerative disk disease. Epidural steroid injection is generally considered to be a safe procedure with a very low complication rate (1). One of the rarer complications encountered is the formation of an epidural abscess following injection (2, 3). To our knowledge, intradural abscess formation as a complication following such injections has hardly ever been reported. An extensive literature search revealed, in the French literature, a single case report of a subdural abscess formation following such an injection (4). A 31-year-old female patient presented to the emergency room with progressive paraparesis for the past 2 weeks and bowel and bladder incontinence, as well as pain, numbness, and weakness in the lower extremities for the past 4 weeks. Medical history included a prior L5/S1 laminectomy and diskectomy for disk herniation performed 1 year earlier. Because the surgery provided no significant alleviation of the pain, the patient underwent three lumbar epidural steroid injection procedures, 6 weeks before presentation with the acute symptoms described above. The exact details of the punctures (site of lumbar puncture, dose, type of steroid), which were performed at an outside institution, were not available. History obtained from the patient, however, suggested that these injections were performed blindly (ie, without the use of fluoroscopic guidance). Neurologic examination of the patient demonstrated bilateral lower extremity weakness, particularly distally. She had an atonic rectal sphincter without bulbocavernosus reflex. She also had marked loss of perianal sensation. The patient was HIV negative. No drug abuse history was obtained. 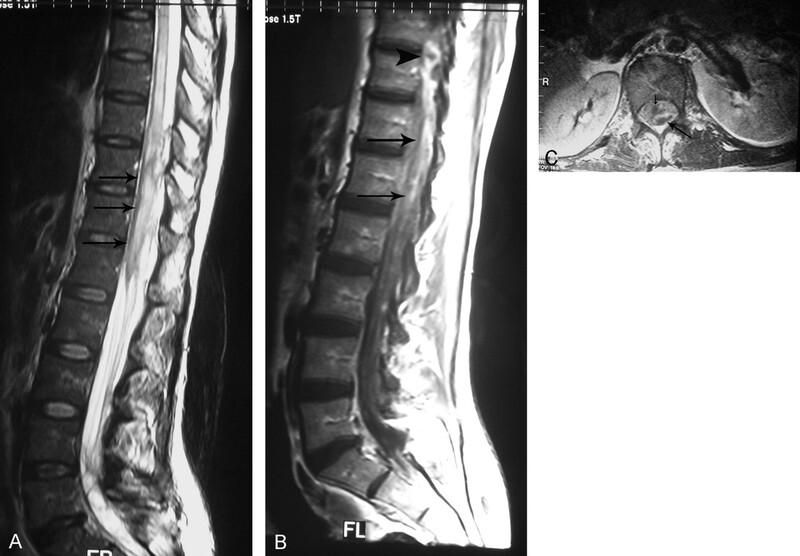 Initial MR imaging of the thoracolumbar spine demonstrated diffuse enhancement of the lumbar subarachnoid space, cauda equina, and leptomeninges from the T8-T9 level to the lower extent of the sac (Fig 1). Enlargement of the lower thoracic cord with increased T2 signal intensity from the T6 level to the conus was also identified. In addition, diffuse abnormal epidural soft tissue enhancement was seen to extend along the exiting nerve roots bilaterally into the psoas musculature from the L4 level superiorly to the S1 level inferiorly. At least two distinct intradural abscesses were noted in the lower thoracic level causing displacement and compression of the cord. One of these was located intradurally at the T10-T11 level on the right side and was seen to displace the cord laterally to the left. It measured approximately 1 cm in its longest oblique axis. The other collection was seen dorsally at the T12-L1 level and measured 1.2 × 0.5 cm in the transverse and anteroposterior dimension, respectively. The conus was anteriorly displaced and appeared to be severely compressed at this level (Fig. 1C). Sagittal MR images of the thoracolumbar spine obtained at the initial presentation. A, T2-weighted image showing enlargement of the thoracolumbar cord with hyperintense intramedullary signal intensity (arrows). 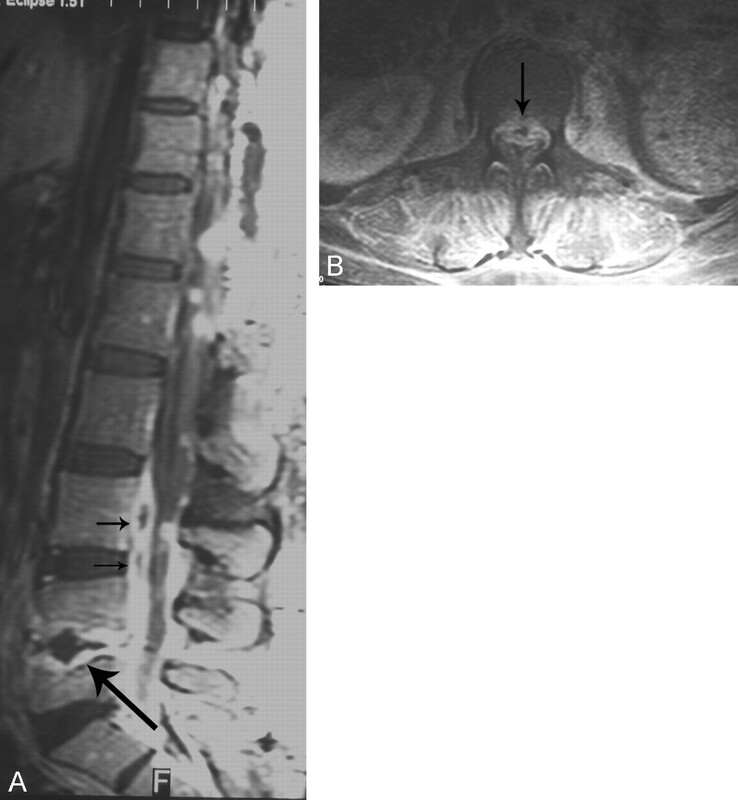 B, Contrast-enhanced T1-weighted image showing enhancement of the leptomeninges and the cauda equina (arrows). The intradural abscess is also seen at the T10-T11 level (arrowhead). C, Axial contrast-enhanced T1-weighted MR image depicting the intradural abscess dorsally at the T12-L1 level (long arrow). The conus (short arrow) is displaced anteriorly and compressed by the abscess. A lumbar puncture performed earlier revealed puslike material, a high protein but no cells. Blood cultures were negative for bacterial or fungal organisms. Because of compression of the cord, surgical evacuation of the T12-L1 collection was chosen. During surgery, a thick-walled cystic collection containing frank pus was found intradurally at the T12-L1 level and resected. The spinal cord itself appeared abnormal, with the pia mater over the cord appearing markedly thickened and hypervascular. No CSF was obtained, because of the dense adhesions and pachymeningitis in the area. Pathologic examination of the contents obtained revealed marked acute inflammation with necrosis consistent with an abscess. Fragments of sepated hyphae were noted on the Gram stain. Culture of the material obtained within the abscess revealed infection by Aspergillus fumigatus. Intravenous amphotericin therapy was initiated. Because of no significant improvement in pain, a repeat MR imaging was performed 3 weeks later, which demonstrated a large epidural abscess collection from the L3-L4 to the S1 level with similar but increased extension into the psoas and posterior paraspinal musculature as seen before. New findings of discitis and osteomyelitis at the L4-L5 level were also seen (Fig. 2). The initially noted right-side intradural collection at the T10-T11 level had also increased in size and was now seen to cause cord compression. Repeat surgery was performed, which included a T9–T11 laminectomy, intradural exploration, and removal of the right-side intradural abscess at the T10-T11 level. A left L4-L5 hemilaminectomy was also performed at the same time, with drainage of the epidural abscess collection in the lower lumbar spine. Repeat MR imaging performed a month later demonstrated improvement in the discitis and the abnormal leptomeningeal enhancement. Slight improvement in pain also occurred. The patient was discharged after 6 months of hospitalization with some residual back pain. The patient has been visiting the pain-rehabilitation clinic regularly and was noted to have had interval improvement in her pain during the last visit, 8 months after her initial presentation. MR imaging performed 3 weeks after the initial presentation. A, Sagittal contrast-enhanced T1-weighted image demonstrating intense enhancement and irregularity of the endplates at the L4-L5 level consistent with discitis/osteomyelitis (long arrow). A large ventral epidural collection was also noted (short arrow). B, Axial contrast-enhanced fat-saturated T1-weighted image at the L3 level showing the ventral epidural abscess collection (arrow). Abnormal soft tissue enhancement of the psoas and the posterior paraspinal musculature was also noted. The use of epidural steroid injections for the treatment of pain and sciatica from herniated discs is quite common, although still controversial. The rationale for the use of these injections is that nerve roots undergo inflammatory and edematous change when compressed by a herniated disk. The anti-inflammatory properties of steroids are thought to result in a reduction of these inflammatory changes (5). Few complications have been reported with these injections (6–8). Minor complications related to steroid side effects include increased temperature, euphoria, depression, local fat atrophy, and rash/pruritis. Rarer but more serious complications specific to injection use such as meningitis (septic and aspeptic), arachnoiditis, epidural abscess, CSF-cutaneous fistula, epidural hematoma, retinal hemorrhage, and conus medullaris syndrome have also been infrequently reported. The incidence of these complications has been shown to be extremely low with the use of fluoroscopy and epidurography during the procedure (8). In a large series, the complication rate was reported to be a low 0.07% in fluoroscopically guided injections (8). Our case illustrates another serious complication (ie, an intradural abscess formation following such an injection). Various etiologies have been proposed for the formation of epidural abscesses (9), any one of which could have led to the intradural abscess formation seen in our case. They include faulty technique, overlying skin infection, blood infection, or steroid vial contamination. Steroids are also known to cause a decrease in local immunity as well as suppress the hypothalamic-pituitary-adrenocortical axis, which may lead to immunosuppression and thus predisposition to infection. Infection by any bacterial, viral, fungal, or protozoal organism is also mentioned as one of the complications on the product label of methylprednisone injections. Fungal infections of the spine are rare. The most common organisms causing mycotic infections are candida and aspergillus. These infections mainly present as discitis/osteomyelitis in the spine. Such infections are seen more commonly in immunocompromised patients, although a few reports of these infections in immunocompetent patients have also been noted (10, 11). MR imaging has shown to be extremely useful in the evaluation of spinal canal infections. MR imaging not only helps in making a quick and accurate diagnosis, but also aids in localization of the abscess to the correct spinal compartment. This information is critical to surgical planning. Similar to epidural abscesses, intradural abscesses are considered a neurologic emergency, because compressive effects on the canal and spinal cord can lead to permanent neurologic sequelae. The use of MR imaging in making a rapid diagnosis was highlighted in our case, where an accurate localization of the abscess prompted the neurosurgeon to perform an emergency evacuation procedure that included opening the dura to evacuate the intradural abscess. Awareness of complications of epidural injections including not only epidural abnormalities, but also intradural and leptomeningeal abnormalities (such as abscess formation) secondary to bacterial and fungal organisms, is of paramount importance. MR imaging not only allows for a prompt diagnosis of these lesions, but also helps in surgical localization to the intradural compartment that provides critical information to the surgeon before surgery and may warrant an emergency evacuation procedure. Accepted after revision July 3, 2003.